What is the purpose of the NRCGA Utility Line Locating Rodeo? The purpose of the rodeo is to showcase the the utility line locating profession. The professionalism, knowledge and skill utilized daily by utility line locators are important factors in underground damage prevention and in keeping our community safe. Damage Free – Locator must be damage free from Jan. 1, 2018, to Dec. 31, 2018 (no utility damages occurred due to your locating responsibilities). An unlimited number of locators from one company/municipality may compete under this eligibility requirement. Registration for competitors closed at 5 p.m. on April 1, 2019. What does my rodeo registration include? A color-coordinated t-shirt and cap based on the division you register to compete in. For example, electric competitors will receive red t-shirts and caps, gas competitors will receive yellow t-shirts and caps, etc. What types of utility lines will competitors locate in the rodeo? There are four divisions and a Jackpot Locate. The four divisions are gas, electric, water and communications. The winner of each division will compete in the Jackpot Locate. The NRCGA will sponsor the winner of the Jackpot Locate’s travel and registration to Missouri to compete in the International Utility Locate Rodeo. Can competitors compete in more than one division? No. Competitors may only compete in one division. What prizes are involved with the NRCGA Utility Locate Rodeo? 100% of sponsorship money will be divided between rodeo winners – 60% to division winners and 40% to the overall winner. 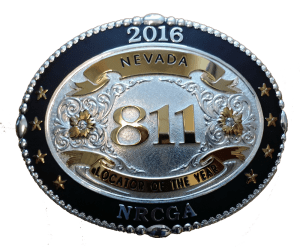 The overall winner also receives a belt buckle, the NRCGA’s Line Locator of the Year Award, and will be sponsored by the NRCGA to travel to and compete in the International Utility Locate Rodeo in Missouri. The winning locator will be announced during the award ceremony at the close of the April 27 rodeo and again at the NRCGA’s annual Damage Prevention Event in the fall. What does the belt buckle look like? Click here to download rodeo rules. Are spectators allowed to watch the rodeo? Can my company sponsor the rodeo? Yes. Please contact Dennis Bott at (702) 232-8010 or dennis.bott@swgas.com for details. Or click here to register as a sponsor. After you submit your registration, Dawn Rivard will email you an invoice. Who do I contact with questions or concerns about the rodeo, registration, etc.? Please contact NRCGA Secretary/Treasurer Dawn Rivard at (702) 486-7214 or drivard@puc.nv.gov.